NBA Champion and All-Star forward Kevin Love grew up in the state of Oregon, and while he never attended the University of Oregon, Love is still connected and supporting the program. Love's father Stan Love was a great Oregon player for the program in the 1970s and Love grew up driving to games as a child. He went onto Instagram two hours before the Ducks faced off against North Carolina to show his support for his hometown team. 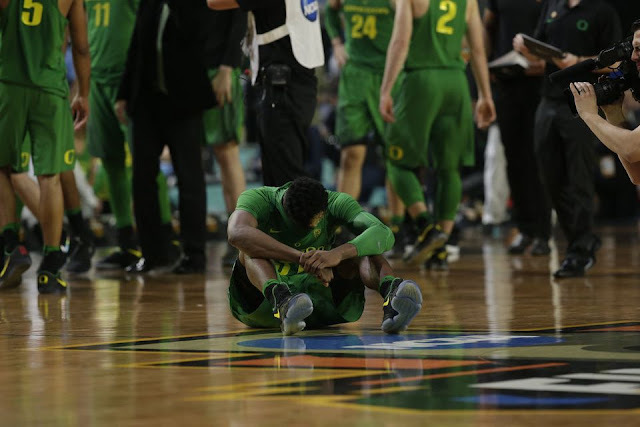 The Oregon Ducks men's basketball team finally ran out of gas as they lost to the No. 1 seed North Carolina Tar Heels Saturday in the Final Four of the 2017 NCAA Tournament, 77-76. The Ducks made it a close game in the final seconds, but missed opportunities down the stretch were simply too much to overcome against the Tar Heels. Dillon Brooks and Tyler Dorsey, who had become NCAA Tournament darlings in the last few weeks leading up to the game, struggled against the length of North Carolina. The Tar Heels size was a major factor, especially in the final seconds where Oregon, with a chance to tie, could not secure a rebound following four-straight missed free throws by North Carolina. Canzano: Oregon Ducks season ends with a Final Four thud -- best of three, North Carolina? GLENDALE, Ariz. -- The game ended and Oregon's guard Dylan Ennis sprinted off the court and darted through the University of Phoenix Stadium tunnel into the first moment of the rest of his life. I wanted him to stop, turn around, go back, and finish what he'd started. Coach Dana Altman wasn't far behind his sixth-year senior, staring at his shoe tops as he walked toward the locker room. A few minutes earlier, on the court, Altman turned to a Ducks assistant and said, "Too many bad decisions. Too many stupid plays." North Carolina beat Oregon 77-76 in a game that was lost as much as it was won. The Ducks' season ended a point shy, and with the Tar Heels missing four consecutive free throws in the final five seconds. As a reward for the effort, UNC gets a shot at Gonzaga for the national title. It's taught at the fundamental levels of basketball. You get position, put a body on the opponent, and find the ball. You might have even said it in your living room at home as the Ducks lined up for the final free throws of the season -- "gotta block out here." But Oregon didn't do it well enough and North Carolina collected its 16th and 17th offensive rebounds of the evening. Game over. Season over. Sadness just beginning. I still don't know if the better team won in this national semifinal. I don't know if UNC is more talented than Oregon. Or if the Ducks got beat by five decades of Chapel Hill-flavored institutional memory. I know the game ended and North Carolina's players came smiling and shouting down that hallway. I also know this: Forget hiking Camelback. If you want to scale a formidable mountain, try climbing Kennedy Meeks. Bigger challenge. I wanted to send them all back onto the court. The Tar Heels. The Ducks. The game officials. Jim Nantz and the CBS broadcast team. Rematch? Best of three? Best of five? Because so much felt unfinished on Saturday night with that one-point margin in a game that was so sloppy and disjointed. Ennis ran down the hallway. Ducks forward Dillon Brooks looked like he wanted to throw something. Tyler Dorsey muttered and fumed. Then, came Jordan Bell, hands raised over his head, his voice wailing toward the ceiling. It's true that North Carolina has decades of institutional memory. It's the same stuff that fuels Alabama and Ohio State in big-time college football. It also has size. Lots of it. Not the kind the slender 6-foot-10 Chris Boucher could have neutralized, either. But I couldn't help but wonder if all North Carolina was trying to do on Saturday was ugly up this game and keep Oregon from finding rhythm. Meeks shot 11 for 13. He scored 25 points. The Ducks didn't have an answer. Forgive me, but watching Meeks control the paint on Saturday made me think of the way Auburn defensive tackle Nick Fairley dominated the line of scrimmage against Oregon in the BCS Championship Game in January 2011. Same exact stadium. Same physicality. Same point-of-attack problem for Oregon. And maybe what comes of this is that Altman's program scours the planet for a 6-foot-10, 260-pound rebounding center that he can utilize to win a Final Four one day. Or maybe Brooks and Dorsey and Bell decide amid their tears and frustration that they ought to come back next season and break through. Or maybe Oregon starts all the way over from scratch. I know what North Carolina did after losing the national championship last season. Remember, Villanova erased a five-point halftime deficit and beat UNC at the buzzer. After that loss Williams said of watching the game-winning shot in the air, "It was helpless. It was not a good feeling." I'm not saying UNC beat Oregon because it lost to Villanova last season. What I'm saying is, you could see it in the Tar Heels players' eyes as they came through the tunnel. They're getting another crack at a title. This time against Gonzaga on Monday. And I'm wondering if the Ducks might be up for some of that. First, though, they need to get real about what went wrong here. Because UNC attempted on several occasions to give Oregon this game, but the Ducks gave it back. Didn't matter that everyone else in a North Carolina jersey shot 14 of 55 (25 percent). Meeks made it not matter because he had eight offensive rebounds and missed only twice in the act of shooting. "Coach told us it was going to be a man's game," Meeks said. It was. Brooks got decked on the way to the basket in the first half. The 77,612 fans in the arena cringed when he hit the hardwood. Bell got smacked in the ribs, rolled an ankle, and got beat up. Dorsey got shoved down in a scramble for a loose ball. Will the Ducks dust themselves off? Will they come back for more? Or will they declare for the NBA draft, hire agents, and file it away as college memory that began fading the moment the final horn sounded? It should haunt Oregon that it never got a final shot. It should stick in their craw. This was a team that fought, and battled, and overcame injury and hardship to make a Final Four. But getting there somehow doesn't feel like enough. I wanted to see these teams play again. UNC graduate and television analyst Kenny Smith said on his way out of the arena that he wasn't sure in the final seconds if he wanted the Tar Heels, up by the one little point, to make that final free throw with five seconds left or miss it. He said: "I was worried Oregon was going to hit a three." I knew they would. But first, they needed a rebound. 0 Response to "Kevin Love shows support for the Oregon Ducks"